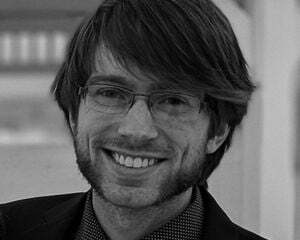 Development on Driftmoon began seven years ago. Seven years! For some context, this game began development when there was only one New Super Mario Bros. and Saints Row game. It is anybody's guess as to the quality of a game with such a long development cycle once it finally releases. It could be great or it could be utter crap. Driftmoon is a classic RPG, reminiscent of games like Dungeon Siege or Dragon Age: Origins. It isn't quite up to the same level of quality as its AAA brethren, but I'll be damned if I didn't come away from the experience with a smile on my face and a serious sense of satisfaction. The story in Driftmoon is solid, if a bit predictable at times. The main character's home town is attacked, but before he can react, his mother pushes him down a well in order to protect him. Once he escapes the watery cavern, he finds that the entire town, with the exception of his friend and a pirate-crab, has been transformed into statues. It is from there that the search for the character's father begins, leading the main character and his friend into a much larger adventure to stop an evil mage from petrifying the entire planet. The story has a hefty chunk of humor strewn throughout and had me laughing out loud more than once. The last act in particular is very well done, and there are some truly memorable characters and interactions interspersed throughout the 7-10 hour romp, such as the aforementioned pirate-crab, a one-eyed statue, and of course Bill. Oh, that Bill! Such a hoot, he is. The writing is extremely solid with hints of brilliance scattered throughout. I got an occasional Hitchhiker's Guide vibe from the humor and circumstances that made me smile from ear to ear. Occasionally, there will be segments that are a bit too dialogue-heavy, with a lot of character exposition that feels like it could have been broken up into easier-to-digest morsels. 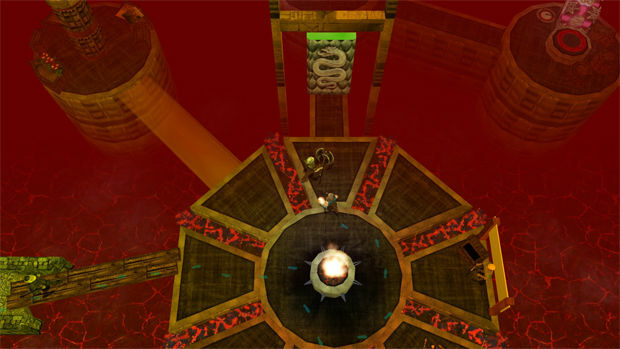 There are a handful of puzzles, some of which use the game's item dragging mechanic. Certain objects around the environment can be dragged around with the mouse, which is a refreshing mechanic as it is not typical of the genre. 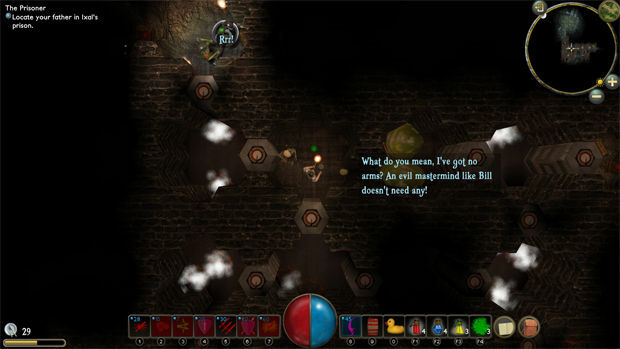 In addition to solving puzzles, this mechanic is used to uncover hidden items under chests, rocks, and the like scattered around the environment. It's a small thing in the grand scheme of things, but it certainly feels rewarding to unearth items by interacting with your surroundings. 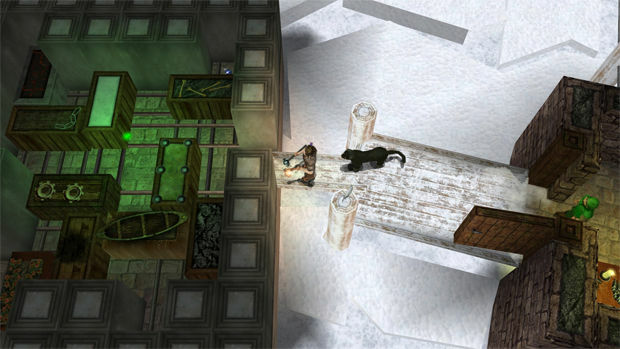 Action takes place in the top-down perspective that many RPG fans are accustomed to. Movement is performed by holding the left mouse button down while directing the character with the cursor; there is no traditional click-to-move. Clicking on an enemy results in the main character, along with any party members, attacking it until the enemy dies or they are told to do otherwise. Killing enemies garners experience points which lead to leveling up, allowing the player to distribute stat points and acquire skills. It all sounds familiar, I'm sure. The expected stats are all there: Strength, Agility, Dexterity, Intelligence, and Constitution. After the initial level up, each additional level awards one stat point to be distributed as the player sees fit. A skill point is also rewarded and can be spent on upgrades and acquiring specific skills through the skill tree. The skill tree itself leaves a lot to be desired, as there aren't very many interesting skills available. You can choose to use either a bow or a sword and shield, but magic attacks are mysteriously absent. There is no fireball, no electric shock spell, or ice shards. It is possible to acquire a magic staff later on in the game, but there are no specific skills to go along with it, making it seem almost out of place. It seems odd to leave off one component of the usual trifecta of bows, melee, and magic. There is also no way to control the other members of the party. They will attack what you click on, but specific commands cannot be issued to specific party members. It is possible to equip them with certain items to aid in their effectiveness, at least. They also cannot die, for if their health drops to 0 they simply become stunned and slowed until their health creeps back up over time. It isn't so much of an issue on the lower difficulties, but the higher ones seem to require a bit more finesse than the game allows. The combat difficulty can be switched between 4 degrees at any time, even during a combat scenario. The difficulty levels seem to simply change how much damage the enemies do and how much they can take, which makes it artificially difficult instead of a tactical challenge, especially considering the lack of direct party commands. Certain landmarks on the map, once explored, act as fast travel destinations and are a nice convenience when a quest calls for some back-and-forth trekking between two areas. It does pay to do some occasional walking though, since there is a food counter that will continually decrease over time. Food can be found pretty much everywhere, and it is unlikely that players will find themselves at odds with the food counter after a bit of exploration. Driftmoon also has integrated mod support, which can potentially add dozens of hours of extra content if the community steps up to the plate. Presently, there aren't many mods that really seem worthwhile, though you can totally add goofy eyeballs on the spiders if you want. The mod tools are also included, though they aren't exactly very welcoming to someone who doesn't know much about mapping or modding. Still, the baseline integration of mods is something that can help a game live on for years and is a welcome addition to any game. Character models and animations are on the simple side, though the visuals are inoffensive so long as the camera stays zoomed out. The environments are quite nice and the frequent use of darkness does a nice job of setting a darker tone against the more light-hearted dialogue. The sound effects also leave something to be desired, as the attack noise is a pathetic "pah" and gives the combat a pathetic feel. The music is the highlight of the aesthetics, coming in at the perfect times and being quite the joy to listen to. Driftmoon seems to me like the perfect introduction to RPGs for someone new to the genre. It's light-hearted, not too difficult on the lower settings, and doesn't overwhelm the player with options in combat or a complicated skill tree. By the same token though, diehard RPG fans like myself will find things like the lack of party controls and the basic skill tree a bit too simple when compared to games like Baldur's Gate or The Witcher. Driftmoon is, in its own right, an adventure worth having though, largely thanks to its witty writing and absolutely splendid humor. It’s a bit of salvation in a genre that seems to be limping by these days. Driftmoon is very obviously a labor of love. A lot of time and dedication went into creating it, and it shows. Though it may fall short in some areas, this is a classic RPG through and through. Beginners and veterans alike should take note and try out the demo at the very least.